Self-sufficient living and building with natural materials may sound like hippie seventies stuff, however this small house manages to combine sustainability with sleek design. 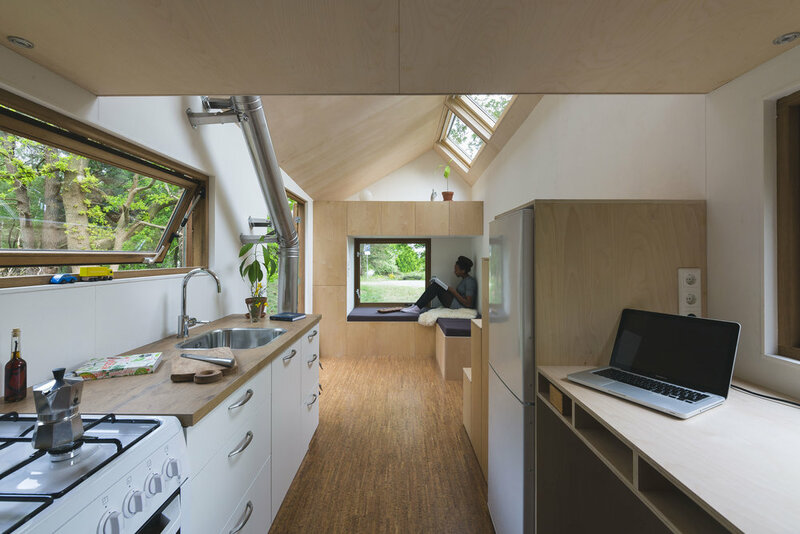 Walden Studio mounted this 17 square meter house on a trailer for Marjolein Jonker in the Netherlands. The compact size of the house led to a multi-functional design, which makes it not just a house with an interior, instead the interior is part of the design as a whole. You enter the house through the front door, made up of two large windows. Once inside you can nest yourself in the corner couch, which accommodates storage space and can also be transformed into a dining table that seats four. In the middle of the house you’ll find a kitchen, the stairs and a desk. The stairs functions as a closet and offers space for the refrigerator. In case you think living smaller equals sobriety, think again! In the bathroom, you can sit back and enjoy a panoramic view while bathing, now that is some small scale luxury. Probably the most defining feature of the house is the big amount of daylight entering the house, thanks to the four roof lights. Despite the constraints of a small sized house, it feels spacious and transparent. This effect is further strengthened by the use of light materials, a white finish for the walls combined with birch plywood. The house is inspired by the tiny house movement. Living small generates more freedom; there is less junk in your house, you have to clean less and you don’t have to worry about a high mortgage since the average price is a fifth of a ‘’normal’’ house. Furthermore, living smaller means using less energy. In this house, a small wood stove can easily heat the entire home and the roof is fitted with three big solar panels that produce the required electricity. In the bathroom a composting toilet has been placed to reduce water usage and create compost. The house will also harvest its own rainwater and take care of waste water with a natural wastewater treatment system. The ecological impact is reduced even further by using bio-based materials. To give some examples, the facade is made out of thermally modified pine wood from Scandinavia, treated naturally to last as long as a tropical hard wood. The construction consists of spruce wood studs and Ecoboard, a sheet material made of agricultural waste products, which has been painted with ecological paint. The floor is made of cork and to keep Marjolein warm during the Dutch winters, the house is insulated with a layer of sheep wool. Marjoleins house is the first tiny house to be legally placed by a municipality in the Netherlands. For now it’s a temporary permit, but the local government is excited about a more sustainable form of living. Of course that will only come into being by real world experiments, such as these.